The only competition in its own niche. Mellow, relaxed tone, great pickup. Intonation issue, looks won’t be for everyone. The story of Brian May’s original Red Special has attained mythological status amongst guitar buffs; assembled from, among other things, pieces of fireplace, a knitting needle tip, a hardened steel knife and two motorcycle valve springs, it has been at the centre of the Queen sound since the 70s. It was almost inevitable in the era of offshore manufacturing that May would establish his own brand producing Red Special replicas, but the extension of the brand to the acoustic guitar, and especially the ukulele, market is something of a surprise. 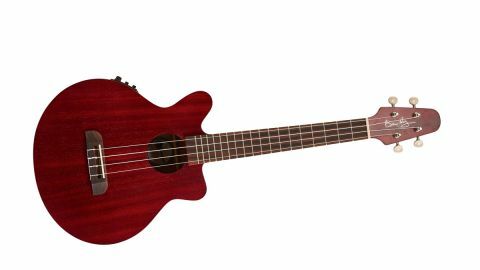 It’s tempting to say that this ukulele looks like the Red Special, but does it really? It has the approximate outline right, but to us it looks like a bit of a missed opportunity that this isn’t an archtop with F hole, since the round soundhole detracts rather from the resemblance. What we have is a laminated spruce top, stained cherry red, but otherwise devoid of any decoration, with the characteristic longer top horn and shorter lower. Back and sides are of laminated sapele, stained identically cherry red. There’s an elegant bridge with rounded ends, bearing an uncompensated saddle, and a matching plastic nut at the other end of the fingerboard. The fingerboard itself is entirely unadorned, in contrast with the Red Special itself. May’s guitar features extra double dots at the seventh and 19th frets, and three at the 12th and 24th fret. The headstock is a trademark V shape, topped with Brian May’s signature, and carries four unbranded open back tuners, with white plastic buttons. The visual appointments may be a little thin, but BMG hasn’t stinted on the electronics: the little Special is equipped with a Fishman Kula pickup system. by a 9-volt battery, and is certainly a step up from the button cell powered units which have historically been found in most ukes, though it does add to the weight somewhat. So does this look like the Red Special? Not really, but it would be a handsome enough ukulele if you weren’t thinking Brian May, and between the large lower bout and slightly longer than usual scale length, it’s quite an imposing beast for a uke. A smattering more decoration might have been nice, particularly on the neck, but this does at least stand out from the huge number of identikit ukes out there. Quality wise, it’s well put together, albeit very simple, with no glaring faults to mention. Unfortunately, when you start to play the uke a couple of problems rear their heads. Firstly, the E string intonates sharp, sufficiently to show clearly on the tuner and to cause some real discomfort when you fret a G chord (the same shape as a D on the guitar), where the D note fretted on this string is noticeably out with the supposedly unison note on the G string. Secondly, there’s pronounced fret buzz on both the C and E strings at the first fret, and a little on the second fret of the C string. These are relatively minor problems that can be sorted with a proper setup, but when your ukulele costs £200 and is all-laminate, you have a right to expect it to be better sorted than this. In all likelihood, these problems won’t be replicated on most Brian May ukuleles. find in every tenor in the shop. The action is reasonable and, intonation notwithstanding, this is an easy uke to play. Low notes are rounded and full, while the treble end is mellow and soft-edged, refreshingly so for a laminate top. The size seems to offset this mellowness, so that in terms of acoustic projection it’s a reasonably loud instrument, though it won’t compete with the loudest and brightest. The lack of fingerboard inlays can be a hassle - at one point we found ourselves playing in a spot that was poorly lit from above, but well lit from in front, which made the fretboard edge markings hard to see, while fretboard markers would have been easy to spot. One thing this ukulele lends itself to is upper-fret noodling, so be careful you don’t get lost in uncharted waters. Plug it in, however, and the BMG really raises the game; the pickup combines well with the naturally mellow tone to make this a nice fingerstyle instrument for the solo player or singer, producing a tone that never sounds thin or weak. Plug in, dial in a bit of reverb, and you have a very solid instrument for live performance. For us, this uke is a bit on the expensive side. It’s all laminate, and devoid of any decoration, yet it costs over £200. On the other hand, the unusually large body and excellent pickup system are plus points, and if you want to look like Brian May on a Hawaiian holiday there is essentially no other option open to you. So it’s a bit of a niche instrument; buy one and you’re guaranteed to stand out at your local ukulele jam, but you might be expected to deliver the solo from Bohemian Rhapsody at a moment’s notice. Entering into the rights and wrongs of basing acoustic ukulele shapes on electric guitar models is beyond the scope of this review, but you want quality if you’re going to spend this sort of money to look like Brian May’s George Formby tribute act. Pop into your guitar shop and give a Brian May ukulele a strum; the big, round tone may well please you, and the pickup system won’t let you down, but check the intonation - that nice, bold LED tuner makes it easy to do.